Yes, really. 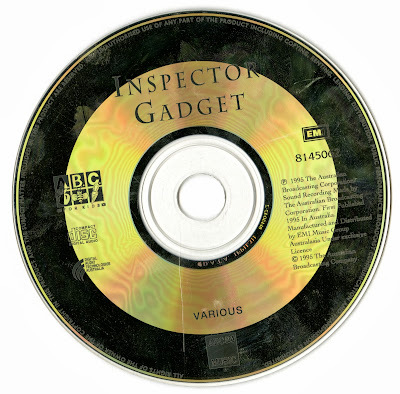 Take a look below at what is probably the rarest Inspector Gadget soundtrack edition of all time: an official, 1995 CD reissue of ABC Records' 1986 LP, "Inspector Gadget - The Music"! I actually bought this many months ago, but only now have I found the time to write a proper blog post about it. I know what you're thinking: how can this possibly be real? But bear with me and let me explain. I didn't believe it at first, either. When I first spotted this CD on Ebay (sometimes last October), I was certain that it was simply a bootleg rip of the Australian LP. The cover looked completely homemade - as if someone had just snapped a crappy photo of the LP art and slammed it on a CD cover. Plus, I had never even heard of a 1995 CD reissue of the Australian LP, and could find virtually no proof of its existence online. (I did find one vague clue, but not enough to fully convince me of anything.) How could this CD exist when nobody had ever heard about it? I had to contact the Ebay seller and persuade him to send me pictures of the back cover and interiors before I could even think of believing that this CD was real. But when he did send those pictures, my scepticism started to wane. The CD was looking more and more official. Sure, The Australian Broadcasting Corporation's music division had changed its name from ABC Records to ABC Music since the original LP. But it was obviously the same company... and the copyright information seemed very legit. Thankfully, all my suspicions were thrown aside when the CD arrived in the mail. The cover still looked awful, of course. Not only is it a terrible drawing, but the low resolution of the CD cover looked even worse in real life than on the seller's pictures. However... when I popped the disc into my player and started listening, I discovered something much more important: the music itself sounded fantastic. The tracks on this CD were not ripped from an old LP. The tracks on this CD were original recordings, taken directly from Shuki Levy's master tapes - or at least from top-notch copies of them. And they sounded cleaner and clearer than I had ever heard them before. And realizing that, something else suddenly dawned on me. As we can see, Télé 80 clearly states that the tracks on their new CD are sourced from "Masters". I tried asking if this was true of all the tracks, but they never answered that question. They have not revealed anything about where they found those master tapes, either. But after I got hold of the 1995 Australian CD, it all made sense to me. They got the masters from ABC Music. Think about it: ABC preserved the master tapes used for their soundtrack edition during the nine years that passed from the 1986 LP until the 1995 CD. Most likely, they have preserved those masters to this very day... and I suspect that, when Télé 80 started doing research for their second Gadget CD last year, it likely didn't take them long to hear about the 1986 LP (which has been listed on Discogs for years) and then get in touch with ABC Music. So, by pure coincidence - because ABC Records happened to take better care of its master material than Saban Records - 16 tracks from Levy and Saban's soundtrack survive on master tapes today! I've been annoyed before that the Australian soundtrack didn't include more unique background music that was not already on the French LP. I still am... but now that I know (or at least feel reasonably certain) that these tracks survive on masters today thanks to the Australian soundtrack, the double-dips feel a bit more justified. Of the 16 tracks on ABC's edition, 12 are background music cues; among them awesome compositions like "Mad Art Museum", "Gadget in Trouble", "Sophisticated Gadget", "Ghosts"... just to mention some of my personal favorites. And here's what I've been wanting to get at all along: If my assumptions are correct, then I'd say there is even more reason to be excited for the new and upgraded Télé 80 CD. Because those specific, 16 tracks - sourced from the ABC masters - ought to sound spectacular. Heck, they might even sound more spectacular on a CD produced in 2013 than on ABC's CD from 1995... although they already sound great there. ...but it is listed on the LP's label (below). I have a feeling that perhaps Saban forgot to include "Chocolate Factory" in the track list that they provided to ABC... and then later on, some ABC employee discovered that Side 1 included one more track after "Kingdom", and decided to just call it "Inspector Gadget Theme", not knowing its real title was "Chocolate Factory". Just a theory, of course, but it might explain why track 6 is listed on the label, but not on the back cover. 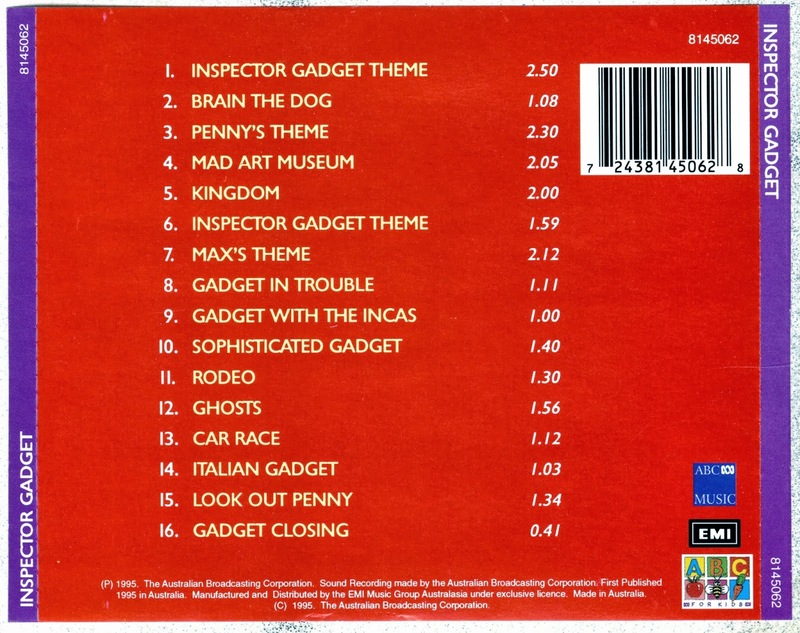 And below is one of the rarer tracks released only on the Australian soundtrack, "Italian Gadget". I'm only sharing the first half of this one, though... you'll have to buy the new CD to get the rest (as well as the instrumental "Brain The Dog", the alternative "Mad's Theme", etc...). I'm hoping these excerpts give you an idea of the CD's sound quality. At least in my ears, the CD version of "Ghosts" sounds far better than the LP-ripped version... which should bode well for Télé 80's edition. All that being said, the 1995 Australian CD is still shrouded in mystery. Why is it so unknown compared to the Australian LP? As I mentioned in the beginning of this post, I did find one trace of the CD's existence on the site Australian Television Memorabilia, in the soundtrack section for the ABC TV series Swap Shop. Under a listing for Swap Shop's 1989 LP soundtrack, it says: "(Re-issued in 1995 in a double CD pack with “INSPECTOR GADGET”)." The year of release fits, as does the publisher, ABC. I contacted the administrator of the site, but he didn't know anything more about the Gadget CD than what was posted online. Personally, I'm thinking that perhaps this double pack reissue of both Swap Shop and Gadget was a very limited one. The fact that the two CDs were a combined reissue might indicate that it wasn't a particularly widespread release, just two old children's TV soundtracks bundled together in a CD package for the few kids/parents who might want them (the "ABC for kids" logo also seems like a hint in this direction). This is only speculation, though. Maybe we'll dig up some facts in the future. Learning about this CD's existence has been a fascinating experience. It reminded me that the internet doesn't know everything. But now, at least, the internet knows a little more. I hope one day recover those master tapes and we hear more about topics Gadget! I hope your answer! "I see you have a magnificent collection of Inspector Gadget..."
Well, my Inspector Gadget collection is not actually that big; it's more of a select collection. But it does contain some rare stuff here and there - the Australian CD being among the all-time rarest, obviously. "I think your blog does justice to an official website of Inspector Gadget.!" Yeah, this is that 'other reason' for buying the new Télé 80 CD that I was teasing in a comment about a month ago. ;) Considering that the 16 tracks on this Australian CD is sourced from master tapes, it feels more and more logical to me that the same 16 tracks will be master-sourced on Télé 80's edition. Which in itself is fantastic. A year ago, I wouldn't have dreamt that *anything* from Levy and Saban's score survived on real master tapes. This probably was some cheap cd sold in toystores or supermarkets that nobody cared about, but now it's a holy grail to some people. Thanks for sharing all those wonderful pictures of both the cd and lp. Right now I'm listening to the new Tele80 Gadget cd and I was wondering what you wrote about it. I think it's a very interesting theory you have where they found the music. My first thought was that they found this Australian cd, mastered the music from that and then sold it on Ebay to you. Hiya Nick! I had a feeling you would find this one interesting. :) "What the.......???" mirrors exactly my own reaction when I saw this CD on Ebay for the first time. ;) It was quite mind-blowing to gradually realize that it was both real and official. "I think it's a very interesting theory you have where they found the music. My first thought was that they found this Australian cd, mastered the music from that and then sold it on Ebay to you." Could have happened, I guess... though I sort of doubt they themselves would have sold it on Ebay. But yeah, I do think my theory about ABC Music still having the master tapes today is more likely. At least if Télé 80's Facebook mentions of "Masters" are any indication. How did you find the new CD, by the way? Did you notice any difference in sound quality between the 16 tracks that overlap with the Australian edition vs. the ones that were only released on French vinyls? Hi! Well, it was the same reaction I had when I heard about the Australian lp...French lp....even when I first found the French single. By the way. Did you ever find a copy of this one; http://www.discogs.com/Inspector-Gadget-Grabacion-Original-Exito-En-TV/release/4269295 ? I'm in the Netherlands, so I guess that's somewhat closer to France than Norway is:) I'm sure you'll have it by now. It's amazing they could find the masters for such a relatively obscure album at such a huge company. I do appreciate the effort that went into this cd, which isn't even made in large numbers. I'm curious to know what you think of it. Ah, right, and here I thought you were living in the U.S. for some reason. I received the CD on Tuesday myself, and my review is coming up (albeit being slightly delayed)! "It's better than the Australian lp version as well , to my ears." "The only thing that I would have done differently is making a more collectors oriented version. The same disc, but with a booklet containing information about the tracks and promote it more to the English world." I can agree with that... it would have been very interesting with a booklet detailing not only the music itself, but the process of finding the master tapes that have been used for this new edition. And how about some comments from Shuki Levy himself? Plus, as far as English language goes, I would have included the English titles of all the tracks. 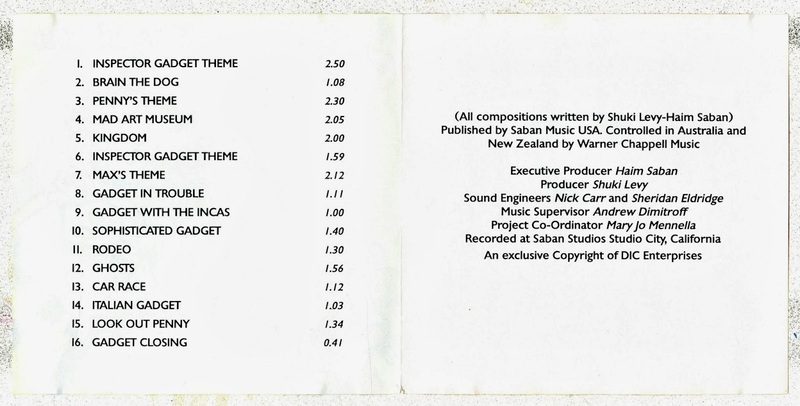 After all, when the music was first composed in Saban and Levy's California studio, the compositons were given English names... so the English track titles are actually the original titles. But, yeah, Télé 80 probably has a set budget for each CD, so comprehensive booklets were likely never part of their business plan. I don't think they considered that the Gadget CD might have more international appeal than some of the other titles they're doing (I wonder if it has sold well, by the way). But of course, the music itself is the main thing and on that account, the CD generally delivers beautifully. I'm curious to your review of the new Gadget cd. I think it's near perfect for such a cheap cd. I I agree on what you said about the booklet and the English titles. Yes, I meant the excerpts I've heard of the Australian record, I don't have it myself. 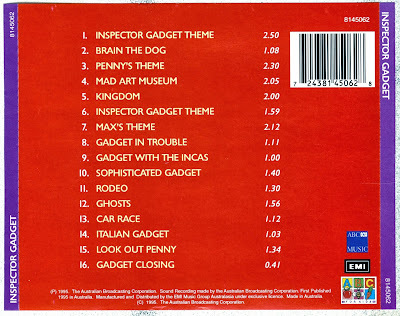 There is a Spanish cassette edition featuring some of the songs from the Horus Gadget LP, though that cassette is titled "Sherlock Holmes - Exito en T.V." (referring to the Japanese "Sherlock Hound" TV series). I came across a picture of it online a while back but am unable to find the link now. Like the Inspector Gadget LP, this cassette was put out by the Horus company and features songs based on various well-known cartoon series like Gadget, Sherlock Holmes, Lucky Luke etc. 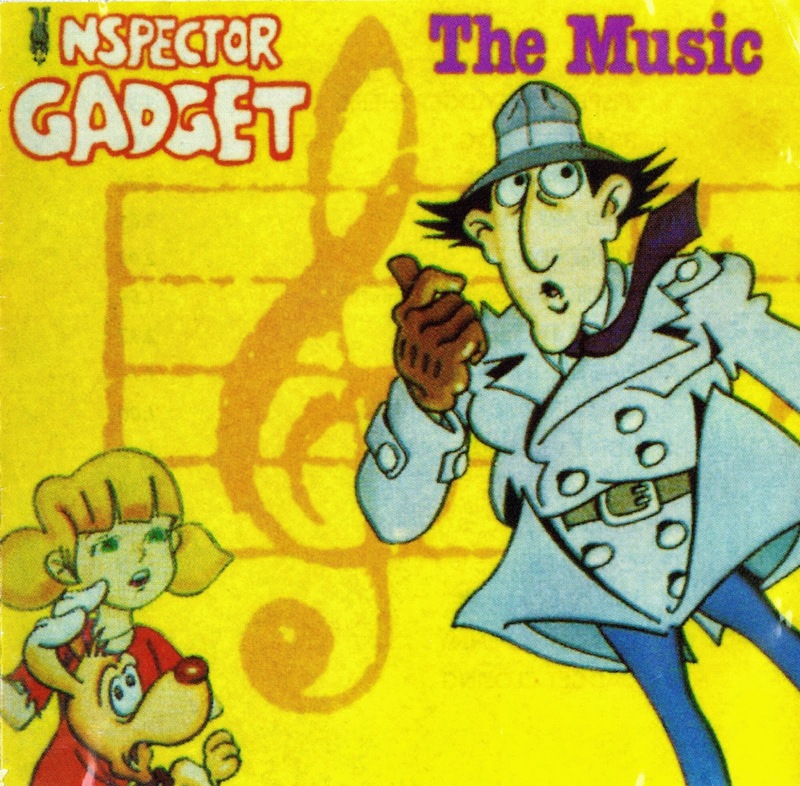 (The B-side of the Gadget LP also featured songs based on other cartoon series besides Gadget: http://www.discogs.com/Inspector-Gadget-Grabacion-Original-Exito-En-TV/release/4269295) As far as I know, there wasn't a cassette edition that was exactly alike the Spanish LP with Gadget - at least I've never spotted one online. And, yeah, my CD review has gotten delayed beyond belief! It is still in the pipeline, though... I've just been so busy lately, and on top of it all came down with an extreme cold the other day which has temporarily drained me of energy. Meanwhile, I'll recommend people to buy the new CD (and it's now available not only on Amazon.fr, but also on many other countries' Amazon sites, like Amazon.co.uk, Amazon.de, Amazon.es, Amazon.it...) Hopefully my review will be out soon. As for sending me some pictures... you have my e-mail address, don't you? I know I have yours. I can confirm that the CD version of the Australian LP was on sale at my local Kmart (Armadale, Western Australia) in the mid-90s. Unfortunately I couldn't quite bring myself to buy it then - I was a teenager at the time, and it would've been too "babyish" despite my fondness for the show! No problems with that sort of thing now, of course. By the way, in case you should be interested, the one track that was mistakenly sped up on Télé 80's CD (track 30, "Inspector Gadget Theme") can still be downloaded in a flawless FLAC version here (as shared by an anonymous reader last year).